A Sentimental Journey | Come Due Maiali / "Like Two Pigs"
A couple of days ago I received an email from a Russian friend of mine recounting his son’s first day of school. For the father, the sensation of reliving his own first day of school was indescribable. I suspect for all of us Russians, September 1st (known in Russia as “Knowledge Day”) will always be meaningful and slightly wistful. They say that often, memories are triggered by smells and tastes. Chrysanthemums, gladiolus, and other fall flowers I see at the farmer’s market always make me think of September 1st, as kids traditionally carry flowers to give to their teachers on the first day of school. 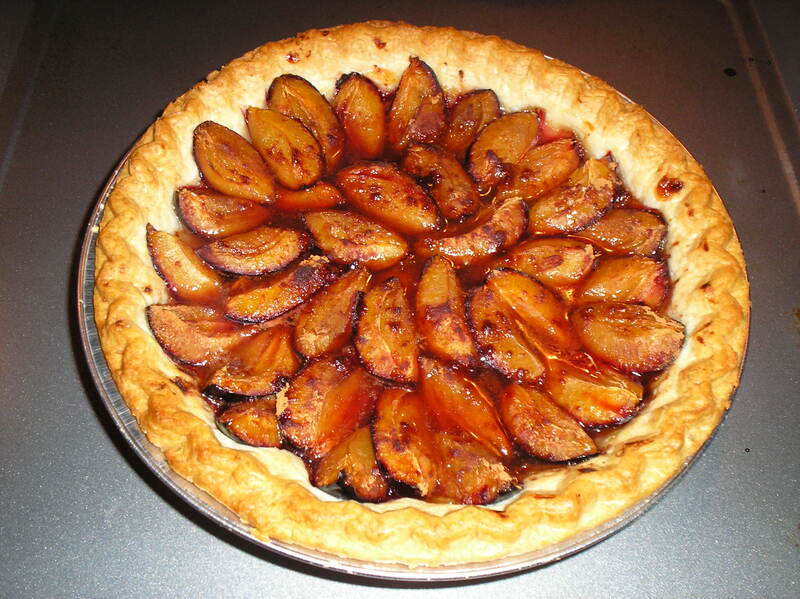 Something else that brings back those memories is fall fruit, especially apples and plums. For some reason, our plum trees in the country house would never bear fruit. Our orchard produced amazing, plentiful apples, cherries, gooseberries, raspberries, currants (black, red and golden “King”), etc. Our neighbors, on the other hand, had several Italian plum trees full of gorgeous fruit. Usually in the last week of my summer vacation, I would succumb to temptation and steal some plums at the very peak of ripeness. Yesterday I came across some nice-looking Italian plums at the farmer’s market, and thought I would do something very simple, like a plum tart. Now, one thing you have to know about me is that fundamentally, I am a pretty lazy person. Some of you may disagree, but as far as cooking is concerned, I shy away from the traditional 20-step classic recipes. I believe that I can maximize my cooking and subsequent eating pleasure by cheating. The goal is to find the least possible amount of work to have the best possible experience; to do so, you have to engage in some heavy-duty marginal utility analysis (i.e., iterative cooking and eating). You learn to rely on the best-quality ingredients and methods producing the highest amount of umami in the shortest time possible (such as roasting). So, here it goes: to make a lazy man’s plum tart, just use a store-bought pie crust, spread a tiny bit of fruit preserves of your choice on the bottom if you like your tarts less tart (I especially like citrus marmalade or ginger preserves), quarter the plums, place them skin side down on the crust (shaped like petals of a flower), and top them with a little pumpkin pie spice and turbinado sugar. (To recreate the childhood experience, I used 2 natural cane sugar packets stolen from Starbucks :-)). 20-30 minutes at 400F (depending on the crust), e voila! Trip down memory lane complete. This entry was posted in food & wine and tagged dessert, plum tart, William Carlos Williams by Come Due Maiali. Bookmark the permalink. Hey, that is the best compliment I could ever hope for!